Abstract : In this report, we present methods for face recognition using a collection of images with captions. 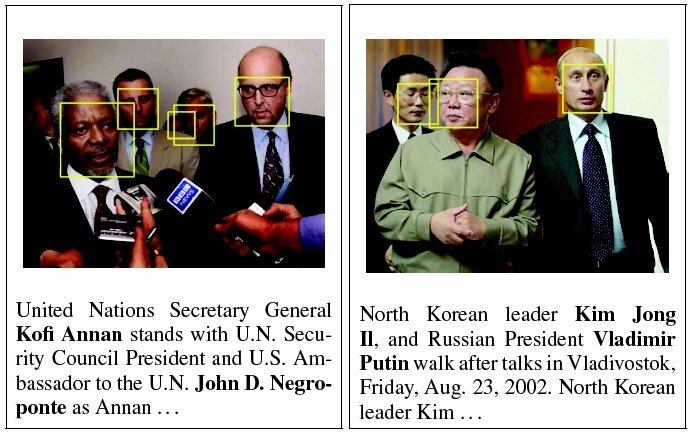 We consider two tasks: retrieving all faces of a particular person in a data set, and establishing the correct association between the names in the captions and the faces in the images. This is challenging because of the very large appearance variation in the images, as well as the potential mismatch between images and their captions. We survey graph-based, generative and discriminative approaches for both tasks. We extend them by considering different metric learning techniques to obtain appropriate face representations that reduce intra person variability and increase inter person separation. For the retrieval task, we also study the benefit of query expansion. To evaluate performance, we use a new fully labeled data set of 31147 faces which extends the recent Labeled Faces in the Wild data set. We present extensive experimental results which show that metric learning significantly improves the performance of all approaches on both tasks.